Centuries ago, weathervanes were one of the first instruments to detect changes in the weather by pointing in the direction from which the wind was blowing. The Tower Of Winds in Athens, Greece (48 BC) is among the earliest archaeological examples, topped with its Triton weathervane. Over the years, a variety of ornaments have been created to display various cultural, religious, and patriotic themes. 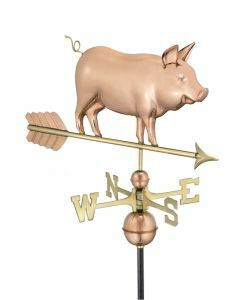 This farm inspired copper weathervane measures an overall height of 46". The ornament dimensions are 20"L x 3"W x 24.5"H. Includes adjustable aluminum roof mount base. Pictured is the Verdigris finish. It is also available in a polished copper finish. Please select the finish from the cdrop down menu. Click on image for greater detail.